I am looking for more info on this work, but I love what I can see already. It's called Minimum Wage Machine, and it's by Blake Fall-Conroy. "The minimum wage machine allows anybody to work for minimum wage. Turning the crank will yield one penny every 4.97 seconds, for $7.25 an hour (NY state minimum wage). If the participant stops turning the crank, they stop receiving money. 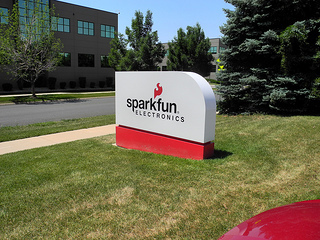 The machine's mechanism and electronics are powered by the hand crank, and pennies are stored in a plexiglas box"
This past weekend I got the chance to go visit SparkFun Electronics' headquarters in Boulder, Colorado. It is quite a busy place, and a lot of people don't realize that they aren't just a warehouse boxing stuff up and shipping it out. They have complete circuit design, manufacturing, and testing facilities on site. I was spending so much time looking around, and having great conversations, that I forgot to take very many pictures though. Here's my Flickr photoset from the visit. You can find out more about them at their website. Fellow Applied Kinetic Arts member, Reuben Margolin, gave a talk about his work at TED recently. 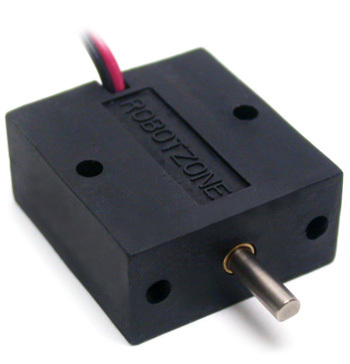 I have been buying from and recommending ServoCity.com for a very long time for RC servos and small motors. I just found that they have added an even wider range of gearmotors, including micro-gearmotors in a block shape with nice mounting holes on different axes. Their selection of chains, sprockets, gears, wheels, and brackets is fantastic, and I have always appreciated the accessible way they present it all. Oh, and their prices are great too. Click here for the gearmotor page. "Make: Live airs tonight! Don’t miss our mechanics episode where guests Lenore Edman, Windell Oskay (in the picture), and Dustyn Roberts join us to show off their kinetic projects"
We've got an incredible collection of gear here at our art space and it's time to get rid of it! Incredible prices! Priced to move! Deals Deals Deals!